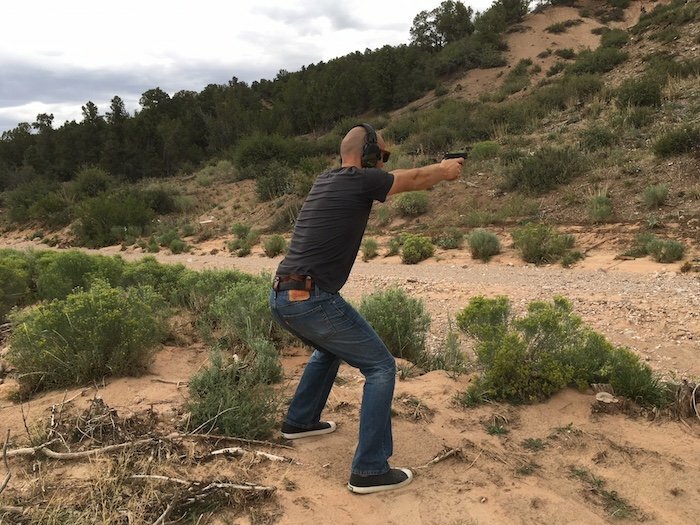 Earlier this summer, I got my hands on the Craft Open-Muzzle IWB concealed carry holster for the Smith and Wesson M&P 9mm. Right off the bat, let me just say I absolutely loved it. I had been away traveling when it arrived in the mail, so the additional wait time only increased my anticipation! After looking it over for a few minutes, and trying it with my gun, I drove to the nearby range to do some draw and fire practice with it. This was in rural southern Utah, so the “nearby range” was actually a 2 minute drive down a dirt road, past the outskirts of town and up against a berm on BLM land. 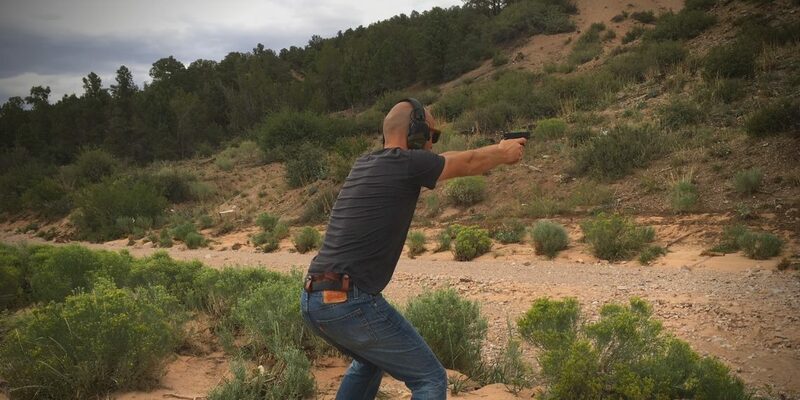 Even though a CCW holster isn’t meant to be a “range holster”, I still like to practice some draw and fire drills when I first get one. For IWB holsters, I have a few general/overall preferences. The first is that the holster be leather. 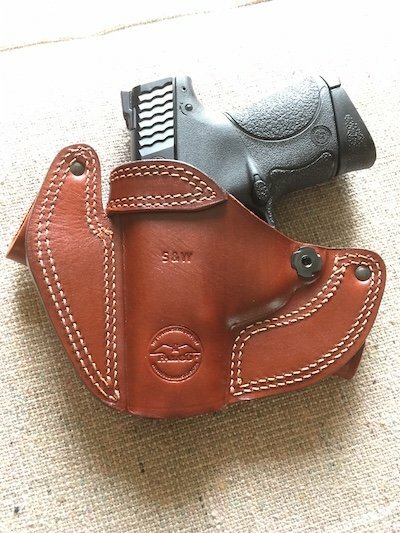 Leather is obviously more malleable then kydex or other synthetics, meaning that over time, the edges will smooth down and the holster will develop a slight amount of “give” next to your body. Leather also stays a little warmer, and in general, is just more comfortable. I prefer carrying on my rear “quarter panel.” Not in the dead center of the small of my back, and not directly on the hip. This has just always felt like the most out of the way and natural place to carry and draw a gun from. Finally, I prefer that the firearm be held in the holster by retention only, not another strap to complicate the draw. As a starting point, the Craft holster ticked all of my baseline boxes. The retention on the holster is fantastic. I usually prefer a retention-only holster, as opposed to holsters that have another strap that snaps over the slide or handle. But this obviously only works if the retention is solid enough to keep the firearm in place. This one is fantastically snug, and puts me at ease. The stitching and other details of the Craft IWB did not disappoint–well made! I should mention here, that if you are wanting to use this as a range holster whree you are constantly drawing and returning your gun to the holster, the retention will likely be too much. You’ll be giving yourself a wedgie every time you draw your gun, and pushing down your pants every time you put it back. An IWB holster isn’t intended to be used like this however, and for me, I prefer the retention tight. Without getting overly technical, it just feels well made. The leather is rigid, with lots of life left to be broken in (i.e. bent, sweat on, banged up, and smashed). It features double stitching, grommets, snaps. All the usual fail points have been taken into consideration, and they do not disappoint. This should be an obvious one, but strangely isn’t. The whole point is to have a weapon that you can conceal, which means that the holster you use needs to be easily concealable also. The amount of times that I’m able to spot somebody that’s concealing a firearm (even while wearing a jacket or other outer layer) is astonishing. The Craft Open-Muzzle IWB holster gets it done here, with almost no leftover space. For me, the less leather that is above your pants, the better (see the above point about being concealable). This means that more of your gun is kept below your waistband also. The Craft could maybe be a hair lower, but not by much. The snaps that loop around your belt are positioned virtually right above the belt, making it difficult to lower it any more. 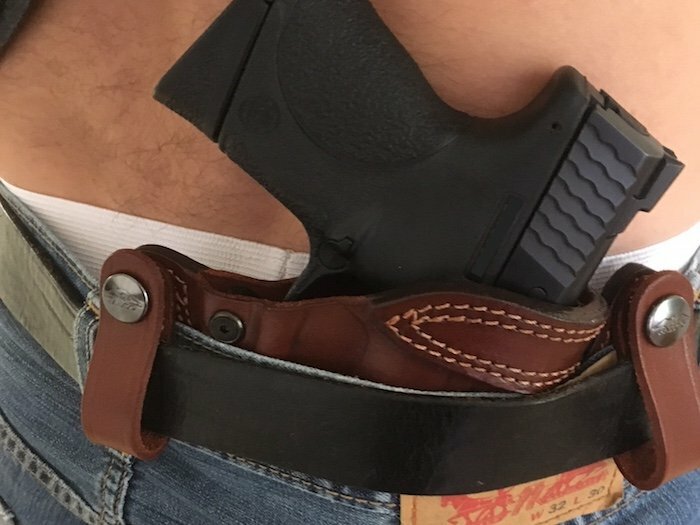 A concealed carry holster should “sit” as low as possible in your waistband, making it less noticeable to others, and less in the way. The Craft holster feels extremely high-quality, and comes in at a very affordable price. Plus it just looks great (I dig the Mahogany leather finish!). Let me just sum it all up by saying that if Jesus were in the holster game, he would’ve made this. I’m stoked to have it, and will be using it as the carry holster for my M&P for many years to come.